It seems 3-d printers are the new big thing in cookie cutters lately. I have ordered quite a few cookie cutters from several different companies. All of which I equally love. In my opinion the best cookie cutters are made by those who are cookie decorators. Cookie decorators just know what works for cookies.....avoiding small easy breakable sections and such. Sometime in April, Tracy of Whisked Away Cutters opened her Etsy store. I was NOT in the first group of those lucky enough to snag some of her cutters. They went really fast. I did however make up for that later when she restocked. Let me say first that her cutters are AMAZING! One of the cutters I purchased was the Bun Bun cutter. The bunny design this cutter was intended for is extremely cute, but there wasn't time for Easter cutters when I ordered so the Bun Bun cutter sat on my desk waiting for next year. That was until the light bulb went off.....Mermaid tails!!! Baked cookies made with the Bun Bun Cutter. 2. Pipe a row of scallops. 3. 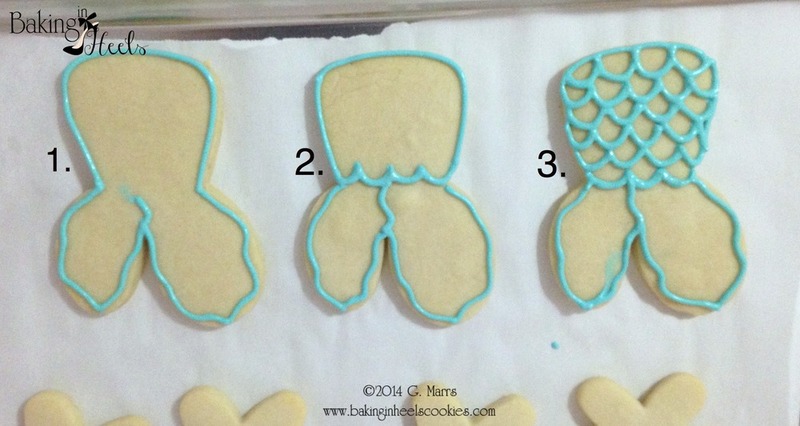 Continue piping scallops to the end of the cookie. 4. 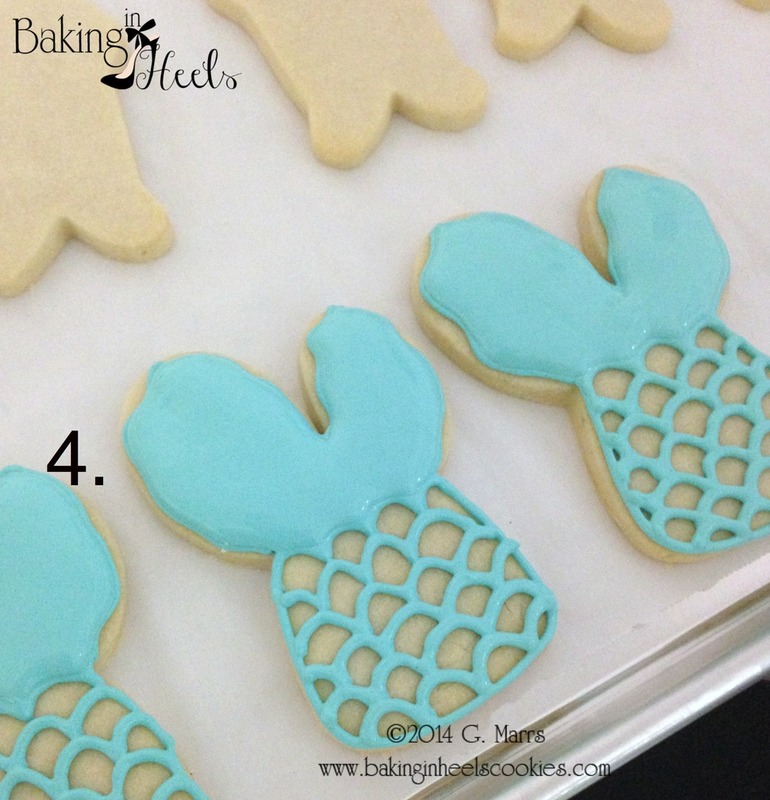 Fill the top top portion of the tail with turquoise icing. Allow to dry for an hour or two. (You can also do the tail in sections like pictured below. For the ones in the picture below I took a #3 tip and piped some thick squiggly lines, leaving spaces in between. 5. (picture not shown) Fill in scallops alternating every other section and let dry for about an hour, then fill in remaining sections. It needs time to dry before doing a section right next to the one you did. 6. Take your airbrush (DON'T BE AFRAID OF YOUR AIRBRUSH) and using Americolor regal purple airbrush color lightly spray the mermaid tails until you have your desired color. Allow to dry. Then I took some Americolor pearl sheen and sprayed the entire cookie. I love the shimmery look. I really love when I can use a cutter for multiple designs. I have a few more designs in mind for this cutter. So check back, I'll be posting them at a later date. Do you ever think outside the box with your cutters? Tell me what you've made in the comments below.